With many workers opting to replace their desktop computers with a lightweight notebook, do they ever consider how it will affect their performance at school or in the office? Laptop risers provide a strong argument for ergonomic positioning for a couple of reasons. First off, it's important to raise the screen up to your line of sight which reduces eye strain. Second, angling the keyboard helps to curb carpal tunnel syndrome. 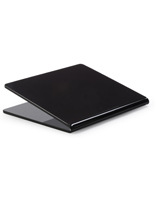 These laptop risers feature both solutions in a number of modern styles and colors. Able to accommodate most portable computers, our notebook bases are simple in design but offer a healthier working environment for office workers or students. What types of stands for portable computers are available? 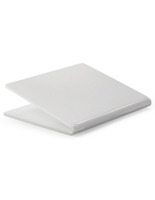 Laptop risers made from high-quality 1/2" thick acrylic feature heat-formed designs in three finishes: gloss black, matte white, and frosted white. The stands with a single bend offer the perfect viewing angle with clean lines for an uncluttered look. Double-bended designs provide storage for accessories such as a keyboard, mouse, or other office supplies. Fully adjustable models feature dozens of possible positions while folding flat when not in use. A built-in fan helps keep your notebook cool during use and four USB ports let you connect battery-powered devices to the computer. Wall mounted workstations are yet another tool for portable computers. While not possessing ergonomic features, these do provide an additional function when working in temporary areas or spaces with no room for tables. 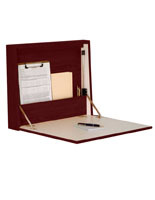 Fabricated from wood with oak or red mahogany stained finishes. Laptop stands for desktops are ergonomic displays that don't have to be adjustable to win people over. Sometimes it's the simple things that make a difference. Their professional designs are sturdy and perform the task of making it easier to use your portable computer, while also adding contemporary style to your workspace.